How being the real you is the first step to making your Lifestyle work for you. 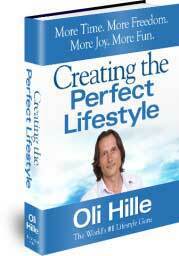 The full chapter on Being YOU will ensure you are fully aligned with your purpose and destiny. Being the real YOU means not wasting any more time chasing after what society, your upbringing or your peers say you should do or how you should do it. Isn’t it amazing that with six billion people on the planet, no-one has the same fingerprints as you. No-one has the same brain-print either. You also have a completely unique character. I have a strong personal belief that God has given every person on earth a unique portion of His character. This means there is something in God’s grand design that only you can complete the way it was supposed to be. My theory makes sense if you believe we are all created in God’s image. Regardless of your personal theology it is certain there is only one unique “YOU” in the world. By definition this means you can make the world a little brighter, a little more joyful and a little more like heaven on earth, in a way that no-one else on earth can! Therefore you must be true to your inner core. You must live the real essence of who you are. You cannot and must not conform to the patterns and norms of the society you were socialized into, if they conflict with or constrain the real you. We all know too many people who conform to what their parents want, or what their peers suggest or what society considers normal. But as we all know, the great strides in human achievement whether in art, science, architecture, technology or exploration, all required breaking out of the normal ways of behaving. Write down the ways in which you have allowed your upbringing, your socialization or your peers to cause you to stop living the real you. Make a decision today to reject any path other than the one you know in your heart is right for you. Pick the one main area of your life that you have not been true to yourself. This might be something you have done, for example taken a job that is not you. Or it could be something you have not done, for example not following a direction you knew you should. Once you have identified the one main area, make a step towards change in that area today. Just because you are successful does not mean you are living the real you and doing what you were specifically designed for. Success is not necessarily a good indicator that you are living to your potential. Let’s say your specific design or calling is to organize food and shelter for the poor and needy in developing countries. You have the perseverance, tenacity, and organizational ability to do the job you were called to. But instead you shut out your call and settle for a job in a Western country where you can fully utilise all of those skills and you are well paid for them. You might be tremendously successful and rise to the top in your field. But you will be dissatisfied because you are not living your true calling, you are not being the true you.